Today we are going to discuss entry strategy and the various types of entry orders. Regardless of what you trade, you will need to know how to enter your position. A market entry strategy is used in the stock market, forex market, options market and every other market out there. If you don’t know how to get into a trade, you won’t be a very good trader. The types of orders used will depend upon what you are trying to do with your trading strategy. 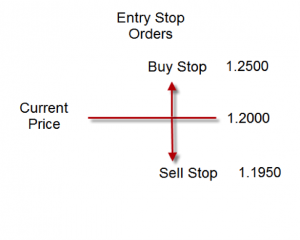 Entry Market Order – A market order is used to enter the trade immediately. You are not guaranteed the price but you are guaranteed getting in. This is used by many traders who are scalping the market. They see a trigger to get in and enter the market immediately at the current price. Take a look at the example below. If the current price is 1.2000 and you place a market order you will enter the trade somewhere around the price of 1.2000. You won’t know the exact price, just that you will get in around the current price. If you need a specific price you will need to use another entry order type. 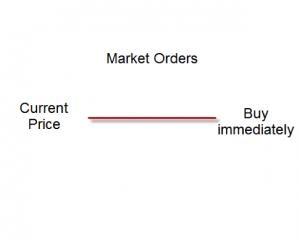 Entry Stop Orders – This is an order that gets you into a trade once the price begins to move a specific direction. A buy stop will buy the position when the price moves up to a specific price and a sell stop order will short the positions when the price moves down to a specific price. Take a look at the example below. In this example you would place a buy stop order if you wanted to enter the trade when the price moves up to your specified price. If the current price is 1.2000 and you wanted to enter if the price moved to 1.2500, you would place your buy stop order at 1.2500. If you wanted to short at 1.195, you would place a sell stop at 1.1950. These order types get you into the trade at a specific price but not a specific time. 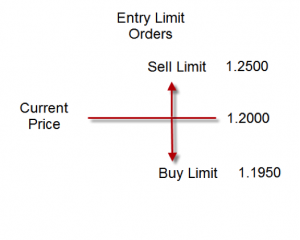 Entry Limit orders – This type of order is the opposite of the entry stop order in that you would be buying when the price moves down and shorting when the price moves up. The idea would be to wait for a better price than the current market price before getting into the trade. See the example below. In this example you can see that if the current price is 1.2000 you would go long when the price drops back down to 1.1950 and you would short if it moved up to 1.2500. Again, you would know the price but not the time for entry. These are some of the more commonly used entry order types. You should take some time to review each of these orders so you know how to enter correctly. You may use each of these types of entry orders depending upon the type of methods you are trading. In one you may use market order, in another you may you entry stops or limits. Regardless of what you use you need to make sure you know what types your platform offers. The more you know about how to enter the trades the more choices you will have in your trading.